Found this for sale locally and while I used to think these were funny looking, when I saw the ones David Wulf had done I was hooked. Had been looking on local craigslist but you never see any mini's except current stuff but this one popped up on a Texas minibike Facebook page. Anyway can anyone tell me anything about this one, like what was the correct engine for it? It was missing the seat but Karen had one with bracket for it so other than rebuilding it I'm missing the throttle gear thing that attaches to the throttle cable. I may have to make one as I think they are none to plentiful. Here are some pics. I knew you got a Powell. :laugh: I use to think they was ugly also but they definitely grew on me. Glad you had the seat with the bracket!!! Ole, that appears to be an E model. 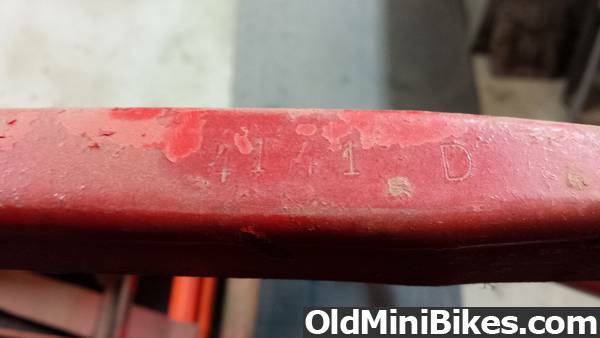 The serial number is located on the top of the frame, where you'd be looking down while riding. I've restored a couple of these. It came with an HS40. The powell driver was proprietary, but I have successfully used the Comet 20 driver, then shimmed the Powell driven to bring it back up from the original 5/8 belt to the Comet's 3/4. All of the bearings for the axles and driven shaft are available. They were available as lighted packages as well. In addition to the throttle, the exhaust was also special. The brake lining around the rear drum can be found on Ebay, and glued on. Your fiberglass clutch guard is missing obviously, and that might be your greatest challenge in finding parts- unless you want to get that original exhaust, and that is real hard to find. Good job. I loved how mine rode, and gifted it to my brother, where it sits in the waiting room of his business. I've got information and photos, and glad to help. It was my 2015 Build Off Bike. Thanks Dave, I’ll look up that thread. I have a hs50 short block I can use once I find the tins. If your thread shows the cover I may be able to fabricate one out of aluminum. I am just in parts accumulation mode now as I am knee deep in the speedway drag bike and predator cylinder head builds. No hurries no worries. I don't think I misidentified it, but your engine mount looks different, more like a D, but it doesn't pivot that I can tell. D would have been BS 5HP. Serial number will tell you all that, and there are other Powell threads here showing various S/N's and models. I put a wanted ad for seat/bracket and Karen (manchester1) came to the rescue. Most of my mini’s are resto mods performance oriented. This will be more of a real restoration. Problem will be cost of rechroming front end. The mount does not move. The shift arm moves rear driven and belt tensioner. Looks like an E or later. Thanks for the info. I will look for the serial # tomorrow and post it. Nice score ole ! The ID number is stamped right on top of the back bone. Here's a Powell thread that bayareaburrito did it will help you figure out the year model. thats cool you got it. i believe that was the same bike david was telling me about on facebook for sale in texas and nobody really wanted it. david could chim in ,but he is on the road to mississippi. racing his powell friday and saturday. if that was a tecumseh model bike originally? Cool score , I actually had first dibs on it but passed , the price was right for sure but I have 2 Powell projects now and decided to act like a normal human for once , lol ! Here is serial number and it ends in E does that mean it is a E model? Yes. That means HS40. On at least some of their E's, they used the Tecumseh replacement blocks. I sent [MENTION=47323]OND[/MENTION] by Tecumseh tag, and it came off of the original engine. Lighting was optional. Your engine base plate is odd, as I think I mentioned before that more closely looks like a D model which had the tilting plate. I believe your SN is fairly early for an E model. That also means you probably have the front end with the round lowers, not the crimped lowers. What this means is that you might be able to take apart your front end and replace the bronze bushings without having to cut off the crimps on the lowers to get the bushings off and back on. (You still have to remove welds on steel ring retainers) You will remove front end slop by doing this. You get to use the white plastic tank with center fill too. Sorry for rambling on again. Obviously I have a love affair with these bikes.